OK, confession: this is not a Cooking With Josh recipe. I made this one late last night, long after Josh went to bed, so that it would be ready for Easter morning. This one I would call Cooking With Nonna. 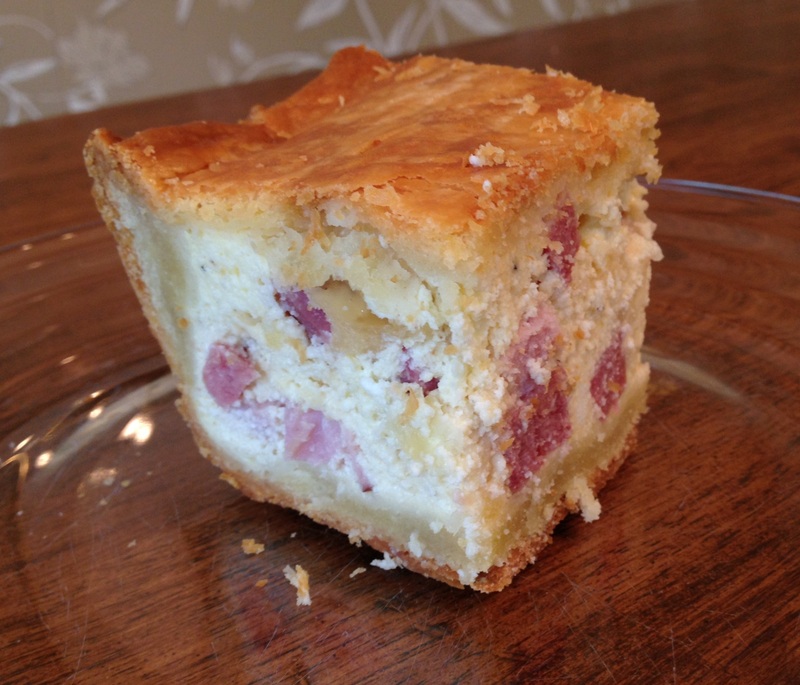 Which is really supposed to be called pizza rustica. But all of that is academic. In my heart–and in my stomach–I know that this dish is really pizza gaina. I’m not positive, but I think I might be the only one of the grandkids who has made this. And as far as I know, no one (including my mother) has anything resembling a recipe. I scoured the web and found this one, adapted from Carlo’s Bakery in New Jersey. I subtracted out the things that I didn’t remember my nonna using and adjusted other ingredients accordingly. What cooked up was a pretty good imitation of the pizza gaina that lives in my memory. Combine the flour and salt. Cut the butter into small chunks and mix it in with the flour and salt until the mixture is the texture of sand. Beat the eggs and add it to the mixture. Knead the dough. Slowly add additional cold water, as needed, until your dough holds together. Knead for several minutes, then wrap in plastic wrap and store in the refrigerator for at least a half hour. In a large bowl, beat 10 eggs. Add the ricotta, grated cheese, and pepper, and combine. Stir in the remainder of the ingredients. Cut the dough into two portions, approximately 2/3 and 1/3. Take the larger piece and roll it out to about a 1/4 inch, until it is big enough to cover the bottom and sides of a 15″x 11″ glass dish. Line the dish, making sure to work the dough into the corners. Add in the egg, cheese, and meat mixture. Roll out the remainder of the dough and cover the top, making sure to seal the edges. Bake for about 45 minutes, then glaze the top with an egg wash. Return to the oven and bake for about another half hour to 45 minutes. You can cover the top with foil if it starts to look too brown. If you have played Skyrim, you will know this dish. If you haven’t ever played, here’s all you really need to know. In Skyrim, you can harvest, gather, or steal various foods and cooking ingredients. Eating food restores your health. But you can also combine ingredients in cooking pots to make dishes with even more restorative properties. 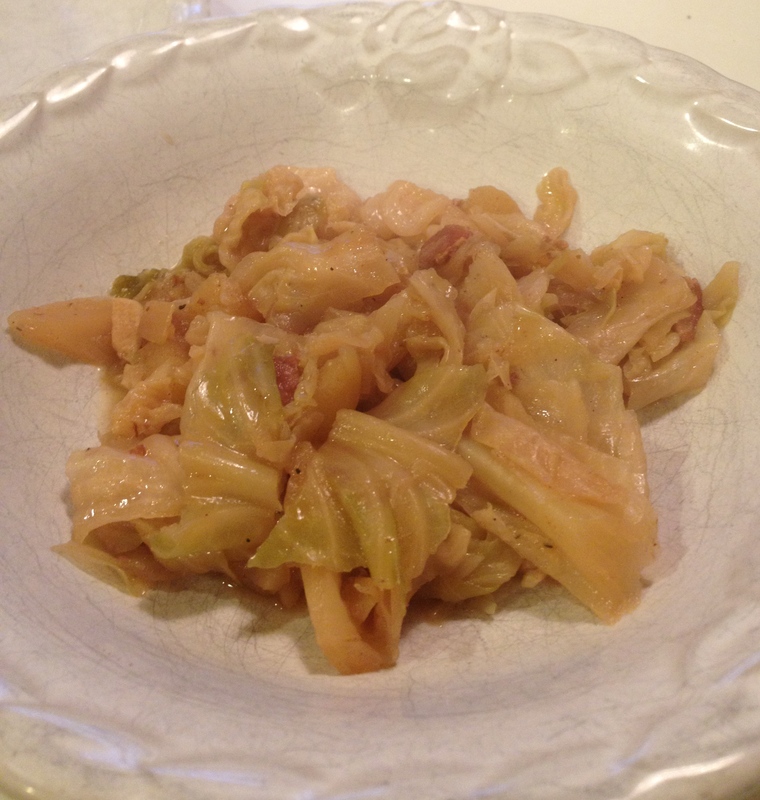 Apple Cabbage Stew is one such concoction. 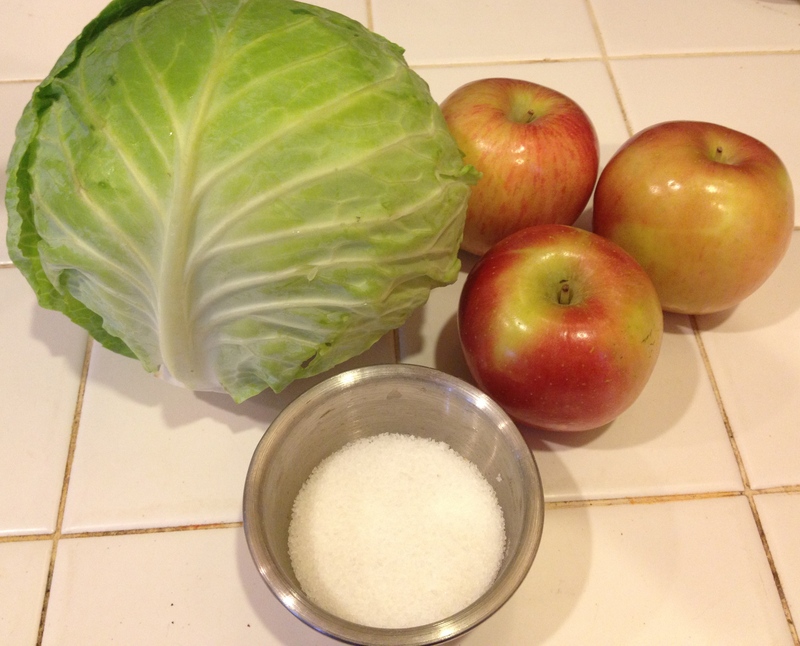 The in-game recipe is very simple: a head of cabbage, a red apple, and a “salt pile.” A little boring, to say the least. Josh and I decided to dress it up a little bit. We debated whether or not to limit ourselves to in-game ingredients, or to add only non-game ingredients (on the logic that it doesn’t really change the in-game recipe if we added out-of-game ingredients). In the end, the only in-game additional ingredients we used were garlic and wine. Apparently there are no onions in the land of Skyrim–just a lot of leeks. Place diced bacon in a steel pot over a medium flame. Once the fat starts to render, add the onion and salt and cook until it begins to brown. Add the garlic and cook for a couple of minutes. Add the cabbage and cook for about 3-4 minutes, until it starts to wilt. Add the wine and deglaze. Raise the heat to high and cook for about two minutes at a low boil. Lower to a simmer and add the apples, nutmeg, paprika, bay leaves and cinnamon. Cover tightly and cook for about an hour, or until most (but not all) of the liquid has reduced. The end result: Josh and I agreed that it was a meal fit for Jarl Balgruuf! It’s been a long time since I’ve shared any of my cooking adventures with Josh–not quite a whole year, but long enough! I promise I will get back to sharing food and family with y’all, but for now, I wanted to point you to another project I’ve started up this year: 365 Simplify. I recently posted a pantry-oriented entry, which seemed a good one to share with readers here. We’ve just come back from a family trip out to Colorado–if my math is right, it was the fifth time we’ve gone.We stay in Manitou, a small, artsy, and self-admittedly weird community just north of Colorado Springs. Every time we go, we rent a suite at one of the roadside motels–since it’s off season, we end up getting two bedrooms, a kitchen, and a living room for less than the price of most national chain hotels. Not only do we save a little money, but it gives us the option of a home-cooked meal whenever we want to take a break from eating out. At some point toward the end of the week, things start to get a little creative as we try to work out what can we make with what we have in the fridge and cupboards without heading back out to the grocery store. Of course, it helps if when you go shopping you are purchasing food items that are versatile to begin with. We always have corn and flour tortillas around the house for just that reason, and that is certainly the case when we are traveling as well. What we whipped up below was our last lunch and took care of most of the leftovers in the fridge. The measurements are estimates at best–the most truthful measure would be: whatever you have left. 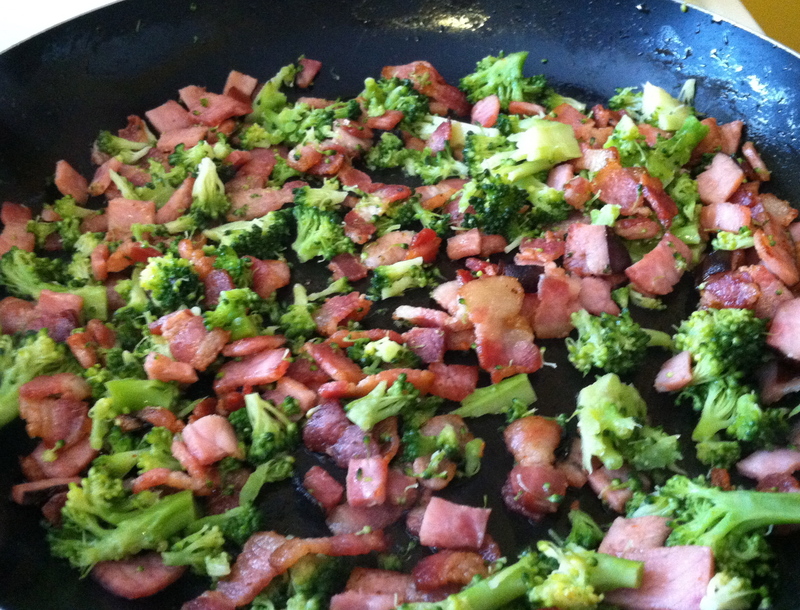 Place the diced bacon in a hot pan and fry until almost crisp. Remove just about all the rendered fat, and then add the ham. Cook for another couple of minutes, until the ham starts to brown in places. Now add the broccoli and cook for another minute or two. Add a few pinches of salt, as needed (depending on how salty the ham and bacon are to begin with). Transfer the saute mixture to a separate bowl and set aside. Now, you could use a new frying pan for this next step, but I usually just give the pan a quick wipe with a paper towel…. Place a flour tortilla in the hot pan. Add a handful of cheese and two tablespoons of the saute mixture. 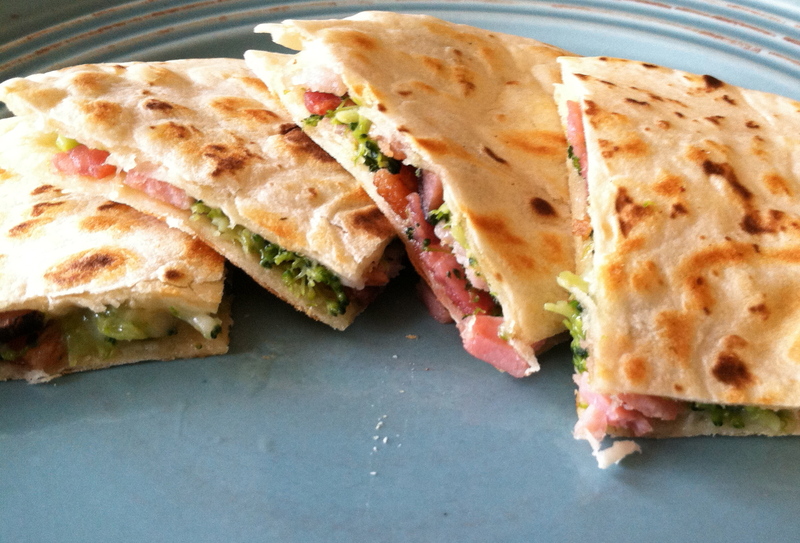 Place a second tortilla on top and press lightly–enough to flatten the mixture without obliterating the broccoli. Cook until the bottom tortilla starts to brown, making sure not to burn it. Turn and cook until it begins to brown on the other side. Set aside the cooked quesadillas for a couple of minutes, then slice into quarter. Serve with, well, whatever else you have in the fridge that you are trying to use up! Maybe it’s the Italian genes that my kids carry, but everyone in the house loves rapini. Rapini, or broccoli rabe, are a great late winter/early spring green–that is, if you can appreciate that “good bitter” taste that I associate with this dish. The other day at the farmer’s market, I saw some good looking bunches and decided to bring some home for dinner. Now I am sure there are plenty of ways to prepare broccoli rabe, and I am sure they are all equally yummy, but for me, rapini are best when served up with garlic and olive oil and tossed in a pasta–and more precisely, gemelli. I can’t always count on Josh’s help in the kitchen on a school night, but it is not at all uncommon for me to grab the phone and give my mother a quick call to double-check her take on a recipe. And to be honest, that’s where all this generational cooking got started in the first place–with me, asking her how to make some dish, and then modifying it a bit to make it my own. And with any luck, I will be getting calls like that from my kids in a couple of decades as well. Wash the rapini and trim off the very base of the stem. Chop the greens roughly, into bite-size pieces, down to the stems. Break off any remaining broccolini that are still attached to the stems and place them with the chopped greens. Place a pot of salted water on the stove (enough water to cook a 1/2 lb of pasta) and add the rapini stems. Set the heat on high and bring to a boil. Just as your water is getting ready to boil, heat about 2 tablespoons of olive oil in a 12-inch stainless steel frying pan. Add the minced garlic and simmer for a minute or two. Then add the rapini (which should still be a little wet from washing) and 1 teaspoon of salt. Cook over a medium flame. Add the gemelli to the boiling water–the time it takes to cook the pasta should be time enough to cook the rapini as well without overcooking it. Watch the moisture in the frying pan, and as it starts to look too dry, add a few tablespoons of the pasta water. 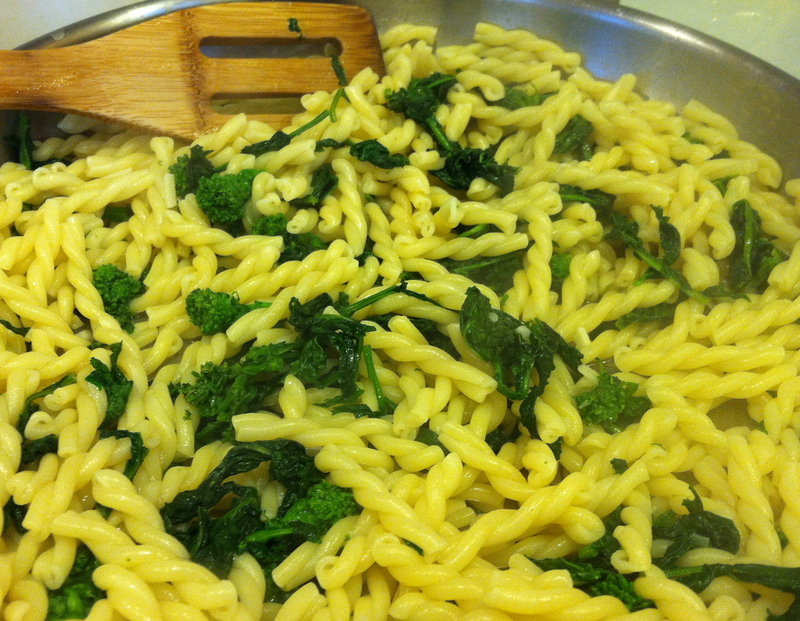 When the pasta is al dente, remove the boiled rapini stems and set aside (eating is optional). Drain the pasta. Next, add the drained pasta to the rapini and cook for another 30 seconds or so, stirring through. Shut off the heat and drizzle an additional tablespoon (or so) of olive oil over the top of the dish. Toss and serve. Serve as you see fit: as is, or with grated cheese, additional olive oil, red pepper flakes, or even a squeeze of lemon. For a brief period–just a few weeks–they show up in our Georgia grocery stores and farmers’ markets. Then they are gone. And more often than not, you have to get there just as the green grocer is unpacking them or you are out of luck, because chances are, they will be sold out immediately. OK, maybe not everyone is that passionate about onions, but baby Vidalias are a true seasonal treat. If you manage to find some still, grab ’em all and figure out what to do with them later. For me, there’s really only one way to prepare them–drizzled in olive oil and roasted in the oven. The more traditional way to prepare spring onions of any variety–called cebollitas in Mexico–is to grill them, but the broiler works just fine. I know: not much of a recipe, right? Wash the baby onions, removing the outer layer if necessary. Cut off all but about three or four inches of the green stems. Split any large onions, especially if the onion already has two bulbs. Rub each in olive oil and lay in a single layer in a glass dish. Salt aggressively. Place under the broiler, set on high, on the second rack. Broil for about five to ten minutes, watching to make sure the onions don’t burn. You want the green stems to start to crisp and for the entire onion to start to brown. Watch also for spattering oil–it can get smoky, and you definitely want to avoid flare-ups. Turn the onions and cook for another five minutes under a high broiler. Lower the broiler to low and cook for about another five minutes. Cebollitas are a great side dish to go with grilled steak. They also make a great little appetizer. The only problem with them is–you only have a couple of weeks to enjoy them. 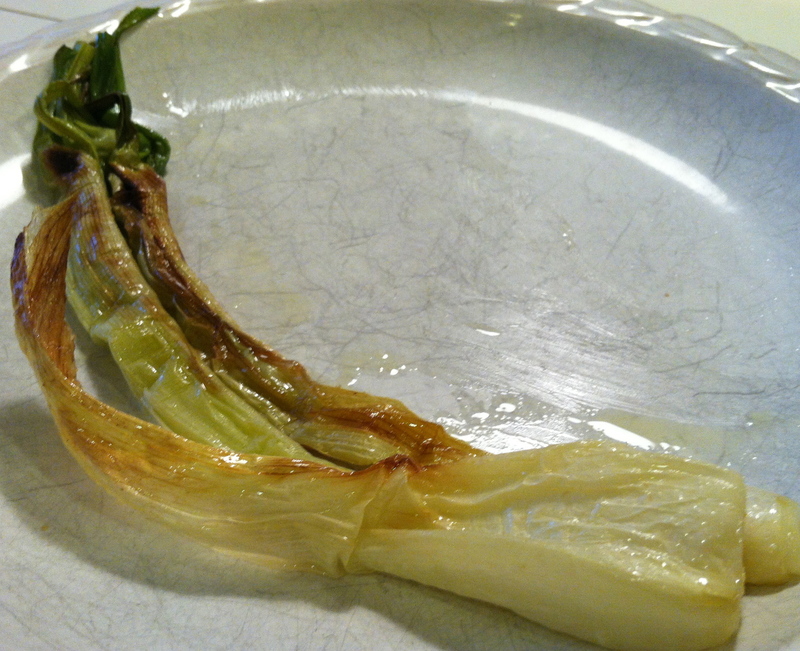 In fact, the sad, solo cebollita pictured above is the last known baby Vidalia onion within a 25-mile radius of Atlanta, last seen on the end of my fork. How did lasagna get to be a special occasion food? Think about it: it’s basically just a casserole, right? An incredibly delicious, and wonderfully satisfying casserole that, in my humble opinion, should be in everyone’s heavy rotation. 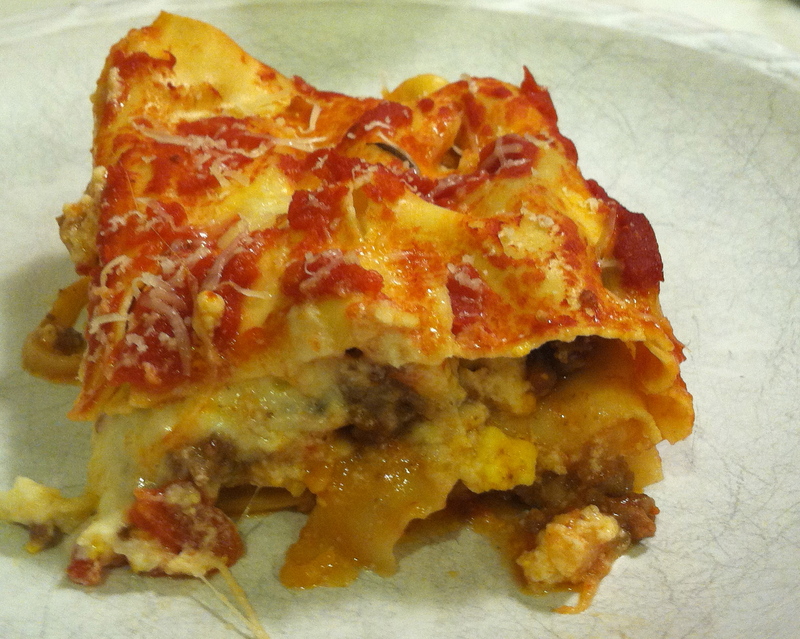 As with most Italian dishes that I cook, this is my mom’s lasagna, with little tweaks. I haven’t really messed with it much at all, really–except I prefer using “no boil” pasta. Truth in advertising, though: this is not truly lasagna Bolognese–the meat sauce is not really a Bolognese sauce, and there’s not a hint of bechamel sauce to be found in it either. But you know what? The kids love it, it’s easy to fix…and the leftovers are yummy too! Get your sauce going–sorry, no recipe for this part. Make it simple, though–garlic, salt, basil. While your sauce is cooking, season and brown the ground beef and sausage meat in a frying pan. Go ahead and prep the rest of your dish at this point as well: grate the mozzarella; add the raw egg and the salt to the ricotta cheese and combine; peel and crush the hard boiled eggs. Once the meat is browned, drain (most of) the oil and add around two cups of the red sauce. You want the meat moistened through, but not soupy. Keep at a simmer for another 5-10 minutes until thickened. Remove from the heat. You are now ready to assemble. Lightly coat the bottom of a 9″x13″ glass casserole with several tablespoons of red sauce. Lay down a single layer of lasagna noodles. Next layer the meat sauce–use about half. Next add a layer of the crumbled hard boiled egg. Next, spoon in about half of the ricotta. Finally, layer half of the mozzarella. Add a few dabs of red sauce, and then lay down a second layer of lasagna noodles. Repeat all of the above: meat sauce, egg, ricotta, mozzarella, and dabs of red sauce. Place a final layer of lasagna pasta over the top and cover with a layer of red sauce–at least 4 oz, but no more than a cup. Cover the lasagna with aluminum foil and bake in a 350 degree oven for about a half hour (everything should be bubbling along nicely by that point). Remove the foil and bake for another five minutes, making sure the top does not start to crisp or brown. Remove from the oven and let the lasagna rest for another five or ten minutes. Just before serving, grate Parmesan cheese over the top. That should do it. Oh, and in case you’re wondering: why the hard boiled egg? I am not sure where my mother picked this up, but that is her trick to keep the lasagna from getting too runny. The egg disappears as both taste and texture in the dish, but it does help to bind everything together by absorbing flavors from both the meat sauce and the cheese. And for the record: hands down, lasagna is Josh’s all time favorite leftover!